These Frequently Asked Questions (FAQs) should be read in conjunction with UQ's Travel Policy and Procedures. Please note the FAQs are subject to change and will be further developed as required. Current as at 11 June 2018. Q: What happens when travel is paid and organised by an external organisation? It is appropriate for the external organisation to continue booking your associated travel. A copy of your itinerary and contact details must be supplied to your supervisor, and as required, the completion of any Work Off-Campus OHS Risk Assessments documentation. You must still have approval to travel on University business in accordance with the Travel Policy. You will be covered by the UQ Travel Insurance if you follow the steps above. Q: Is the travel considered to be “UQ business” if a visitor is travelling to UQ to meet with UQ staff/present a guest lecture etc? 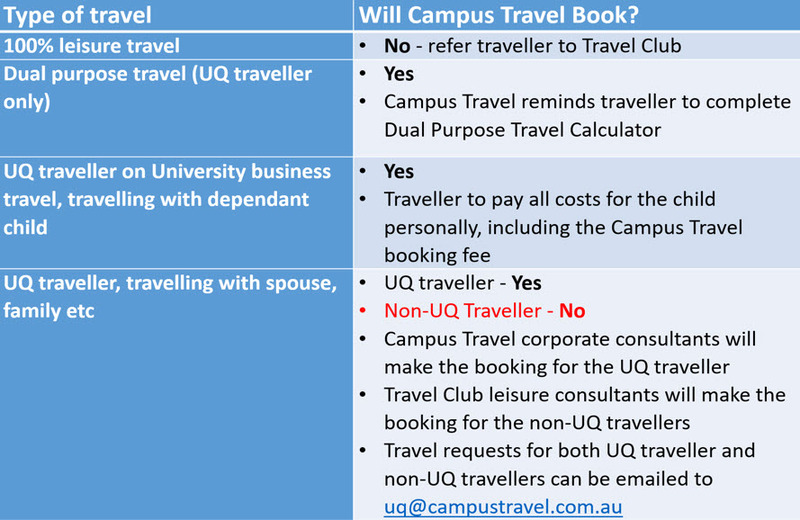 Visitors such as guest lecturers, external collaborators, academics flown to the University for job interviews are not part of the definition of UQ traveller/University business under the Travel Policy. Therefore there is no policy requirement to use Campus Travel for such bookings. However, we recommend where possible bookings are made via Campus Travel. This allows access to negotiated discounts and increases the consolidated spending power of UQ for future airline negotiations etc. Q: Does Campus Travel have to be used for group student travel – e.g undergraduate field trips? No, this is not considered official UQ business, nor are they representing UQ. Therefore booking through Campus Travel is not required. Q: Are there any exceptions to using Campus Travel for UQ travellers? The University recognises that certain circumstances sometimes warrant an exception to the requirement to book through Campus Travel. Students, including HDR candidates, undertaking travel related to their program. This includes travel on field trips, exchange, placement, scholarship or grant. Travel must be approved and the Insurance Travel Notification Template must be completed and sent to Insurance Services by the approving supervisor. Staff travelling as part of their Special Studies Program (SSP). Travel must be approved and the Insurance Travel Notification Template must be completed and sent to Insurance Services by the approving supervisor. University travel that is booked and paid for by an external organisation or self-funded by the traveller where no reimbursement is requested from available UQ funds. Travel must be approved and a copy of your itinerary and contact details must be given to your supervisor. UQ travellers whose primary place of residence is outside of Australia. Travel must be approved and a copy of your itinerary and contact details must be given to your supervisor. When Campus Travel cannot match a conference package. Travel must be approved and a copy of your itinerary and contact details must be given to your supervisor. Accommodation and car hire associated with research and field work activities, where a pre-planned detailed itinerary is not feasible and high flexibility is needed to meet the business requirement of the trip. Examples are research dependent on local environment (eg. Weather) or nature of monitoring/research (eg tagging of animals). Exception must be approved prior to departure by the Head of Business unit. Completion of Work-Off Campus Plan. Research and field work where it is not feasible for a travel agent to book –such as accommodation offered by alternative lodging providers (e.g research facilities, remote communities, camping grounds). Research and field work where the accommodation sought is part of a broader offering integral to the business requirement of the trip (e.g access to additional facilities, access to dive boat etc). Completion of Work-Off Campus Work Plan. Unexpected last minute flights (and associated accommodation) originating in a country outside Australia whilst the original trip is in progress. Supervisor approval is required for late change. Send revised itinerary with contact details to Supervisor. Q. Will Campus Travel book staff personal travel and travel for my family? Yes. Please refer to the below table for further reference to the conditions for staff and personal travel bookings. Q: How will UQ staff obtain approval for domestic travel? A UniFi Travel Request is no longer required for domestic travel and written Supervisor approval (usually via email) is sufficient. Business Units should not create a local form or database to record domestic travel approvals. The onus is on the traveller to check if there are available funds for the trip. Q: How will UQ staff obtain approval for international travel? The approval process for international travel remains unchanged for now. Staff will be required to submit an International Travel Request in UniFi prior to booking travel. Minor changes have been made in the “Field Trip approval” step. Updated UniFi International Travel Workflow training material is available now on Blackboard. Q: What is regarded as '7 continuous hours' when applying for Business Class travel? 7 continuous hours is determined by the duration of the flight i.e. As in the policy, it is at the discretion of the appropriate USMG member to approve premium / business class for flights greater than 7 continuous hours. Premium and business class flights are reported on monthly to the executive team. Travellers also have the option to self-fund the difference between the economy fare and the premium / business class fare should they opt to. This does not require USMG approval. At the time of requesting quotes, Campus Travel will be able to offer assistance and guidance to travellers / bookers in regards to the premium / business class policy with more clarification on what is permitted for individual bookings. Q: Can I travel a higher class than Economy if my research grant conditions allow? Q: How do I claim for UQ Travel Allowance via EMS ProMaster? Attaching relevant supporting documentation in PDF format (Domestic - Supervisor written approval; International - UniFi International Travel Request approval email). Note: Travel Coordinators who enter UniFi International Travel Requests on behalf of others will need to forward the travel approval notification email they receive to the traveller. Q: What is a UQ Travel Allowance? The purpose of the UQ travel allowance (for both domestic and international travel) is to cover the additional expenses incurred living away from home, while travelling on official University business. The allowance is only payable for overnight journeys and will be calculated per overnight stay while travelling on University business. Q: How much is the Travel Allowance? The domestic travel allowance rate is $85 per overnight stay while on UQ business travel. The domestic travel allowance rate applies to all locations in Australia. The international travel allowance rate is determined by country, per overnight stay while on UQ business travel. To help with planning and budgeting, UQ Travel has developed a simple ITA Budget Calculator [XLS]. Q: What expenses does the Travel Allowance cover? The UQ traveller’s meals: food and drink for breakfast, lunch and dinner, morning and afternoon tea. The UQ traveller’s incidental expenses such as snacks, drinks (water, coffee, tea etc. ), gratuities, low value public transport (e.g. local journeys on a local bus, tram, train etc. that doesn’t cost more than 10% of the total overnight allowance). Any other personal services rendered by the UQ traveller: phone or internet charges, laundry, dry cleaning, room service, etc. Q: What about Travel Allowances for non-UQ staff such as students? The current process for non-staff and students remains unchanged. Q: What will happen with Travel Cards? UQ is in the process of phasing out Travel Cards for staff travel. As of Monday, 11 June 2018, all Travel Allowance requests (both domestic and international) for UQ staff must be applied for via EMS ProMaster. Until Travel Cards are phased out for staff travel, UQ staff can still use Travel Cards for actual expenditure in certain circumstances. For more information on the use of Travel Cards refer to PPL 9.43.03 Travel Cards or see Travel Cards FAQ below. Q: Is there a limit on the number of days UQ Travel Allowance can be claimed for? If a UQ traveller is planning to claim a travel allowance exceeding 90 days in the same location, Finance and Business Services (Tax) must be consulted prior to submitting the allowance claim. Q: How do I load funds onto a Travel Card? In certain circumstances a UQ traveller may apply for a Travel Card (a debit card with a pre-determined cash load) to pay for expenses while they are travelling. UQ staff can only use Travel Cards for actual expenditure and not for paying travel allowance. See Travel Allowance for further details on how travel allowance is paid to UQ staff. For more information on the Travel Card application and card management refer to PPL 9.43.03 Travel Cards. Q: Who do I contact if I haven’t received my Travel Card statement within 30 days of requesting? Please contact fbs.support@uq.edu.au who will liaise with MasterCard on your behalf. Q: My Travel Card statement includes previously reconciled transactions. Who should I contact? Q: What if I require assistance using my Travel Card or have forgotten my PIN? Enter 11 to access the menu in English. Enter 2 for card activation or PIN assistance. Enter your full card number followed by the # key. Enter your date of birth in the format DDMM then press the # key. Enter your card's 3 digit CVV number from the signature panel on the reverse side of the card then press the # key. Enter 1 again when prompted. Your PIN will be read back to you. Contact Finance Client Support Services for assistance using UniFi.